The Fiber Laser FL-20 laser marking and engraving machine offers the latest and most advanced features in the laser marking industry. 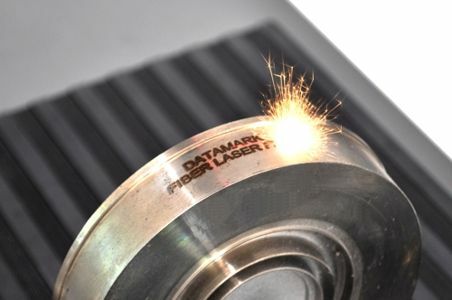 Its fiber laser engine offers high power peaks, fast processing times and maximum application flexibility to mark with total quality and precision in all types of industrial parts and materials; metals, alloys and most plastics. The ML-100 system consists of the laser source generating unit and the compact marking head with motorized galvanometric mirrors, both connected by a protected flexible fiber conductive cable. The marking systems is very easy to install as a desktop workstation or directly integrated into automated production lines. The control and programming of marking messages is easily done using the fully featured and intuitive Datasoft PC software, connected to the marking machine via USB interface. Datamatrix codes marking for automatic parts identification. Graphics and logos laser marking. Advanced fiber laser engine pulsed by high performance diodes. High quality of construction and modular design, easy to install. Focus finder red light pilot for quick adjustment of marking distance. Marking preview feature with quick position adjustment ok marking data. Digital IN/OUT signals interface for laser control and monitoring. Marking capability for dinamic marking on moving parts. Text marking, graphics marking, barcodes, Datamatrix codes, etc. Diodes pulsed fiber laser technology. 110 x 110 mm (4″x 4″) marking window with standard F160 lense (expandable). Maximum laser output power 20W. Maximum marking speed; 6000 mm / second. PC control via USB2.0 interface connection.